Ah! Happy memories... Happy Families. Now here's an excellent idea. Take an old family favourite, add some well known and loved characters and you end up with a very cheap, yet enjoyable game. All your favourite characters are here including Bugs Bunny, Tweety, Sylvester and Wile E. Coyote and each one is beautifully printed in full-colour, glossy artwork. I'd also snap a pack of these up as soon as possible before Warner Bros realise that the packs have been printed incorrectly. On the back of the box that houses the cards it proudly states: "Collect four cards from your favourite Disney cartoons as quickly as possible." 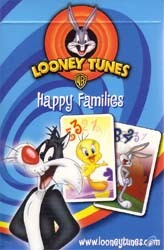 Last time I checked Warner Bros owned the rights to Looney Tunes, not Disney. Cheap, cheerful and very good fun.